Veterinary surveillance is vital for the Irish pig sector - as for other countries - John Moriarty, the Head of Pathology at the Central Veterinary Research Laboratory for Ireland's agriculture department, (DAFM, told the 2014 Teagasc Pig Farmers' Conference. Increased global trade and movement of animals and animal products is good for Ireland agrifood but it must be balanced by increased vigilance. Current world trade and the movement of people, animal and products facilitate rapid movement of disease agents globally and thus increase the potential for disease incursion into naïve animal populations. Disease incursion is further facilitated by animal intensification and more centralisation of farm and production systems. These together with extended distribution systems help rapid spread of both known and newly emerging disease agents which are potentially catastrophic to farms, animal industries and the national economy. Equally costly to individual farms and the economy are the so called production diseases. These are the simmering and apparently low level endemic diseases occurring in the majority of herds that sap resources and profitability through poor growth, extra feed costs, subclinical disease and excess antibiotic usage. The cost of endemic conditions, such as respiratory disease, to an enterprise is always greatly underestimated and is often addressed as a balance sheet cost item where an apparently low level disease occurrence stays within so-called "acceptable" limits. “The total economic damage caused by production diseases in livestock is larger than the damage caused by notifiable diseases such as Foot & Mouth,” according to Henk Hogeveen, Associate Professor, Business Economics of Wageningen University & the Department of Farm Animal Health, Faculty of Veterinary Medicine of Utrecht University. Constantly changing and evolving production systems provide continuous opportunity for a change in behaviour of a known disease agent or the emergence of new agents. The fear of ASF penetrating Europe, the emergence of PEDv causing devastating piglet mortality in America, the change of behaviour of klebsiella, which is now causing many outbreaks of septicaemia and death in free range pigs in the UK, an apparent change in oedema disease discussed by veterinary pathologists at a European patho-surveillance meeting recently, all point to risk and change as being the norm and the ability to identify and respond to these risks and changes as being the prerequisite. Viral circulation is on the rise and ASF is now established beyond Africa, in the Caucasus, the Russian Federation and Eastern Europe. Any country with a pig sector is at an imminent risk from an ASF introduction. The informal movement of infected pork products has allowed the virus to jump across the globe thousands of kilometres from its source. The sudden emergence of porcine epidemic diarrhoea virus (PEDv) for the first time in the United States caused significant economic concerns. Since its recognition and diagnosis in May 2013 by veterinary pathologists and virologists in the National Animal Health Laboratory on being alerted by specialist pig veterinarians, PEDV has spread rapidly across the United States, resulting in high mortality in piglets in more than 30 states. The economic cost of PEDv at farm level is between $216 to $338 per sow space with the loss of up to 10 million piglets in the US alone last year. Defra-funded surveillance carried out by the VLA raised 160 alerts of possible new animal disease between 2005 and 2008, which on further investigation led to the identification of 26 emerging (or re-emerging) animal diseases or syndromes. When foot and mouth disease struck the United Kingdom in 2001, 57 farms were infected before the disease was first reported. Timely detection and understanding of disease is required to facilitate efficient and effective response and thus reduce impact on farms and the economy. Credible animal health information can only be produced by credible surveillance involving the appropriate diagnostic expertise and capability, surveillance footprint and communication. This not only serves to improve animal health generally by guiding timely veterinary intervention but also helps protect the industry from trade limiting disease, thus providing competitive advantage where absence of these diseases is demonstrable. However, underpinning all the subcategories of surveillance and health schemes is the requirement to have expertise and capacity in veterinary laboratory diagnostics (veterinary pathology, virology, bacteriology and toxicology) that provide the specialist diagnostic capability and information required to determine disease trends and response needs. These disciplines need a critical mass of experts and case throughput to maintain that expertise in the various veterinary laboratory diagnostic disciplines so as to service the needs of the pig industry. To do this they need to gain and maintain the confidence of specialist pig veterinarians and herdowners; confidence that is hard earned and easily lost. Unfortunately internationally these fundamental disciplines are depleted, substantially due to rationalisation and dilution of efforts, and this has resulted in a loss of critical mass and expertise. The AHVLA network of diagnostic laboratories covering England, Wales and Scotland offers diagnostic and consultancy services to producers through their veterinarians. These are similar to the Irish Veterinary Laboratory Service and its regional distribution of laboratories and are staffed by veterinary diagnostic specialists such as pathologists and virologists and are the key component of animal health surveillance in Great Britain. They provide in-depth diagnostics and information on health problems and new syndromes of all species including pigs. The AHVLA is currently undergoing uncompromising rationalisation. Also in Great Britain, health schemes have become an important tool available to farmers and their veterinarians for monitoring and tackling important health problems affecting efficiency of production and/ or animal welfare. Two initiatives have been implemented by the pig industry there: Wholesome Pigs Scotland (WPS) and the BPEX Pig Health Scheme (BPHS). These schemes record the presence of a range of lesions associated with a reduction in performance traits or are indicators of animal welfare problems. The combined results from both schemes provide a powerful tool for prevalence estimations on endemic diseases in the British finishing pig herd. However a particular weakness is that lesions associated with challenges early in the life of the pigs will not be detectable in the abattoir and cannot be monitored by the schemes. Deaths on farms are also not accounted for. It is therefore important that the results of the health inspections in the abattoir are carefully interpreted within the context of the current and historical information available on the specific batch of pigs and the farm in general. Similarly, a network of sentinel pig veterinary practices with clients in all pig-producing areas collate surveillance information from practice activities. The clients for whom the information is recorded remain anonymous. Within the CVRL there are three divisions dedicated to veterinary pathology, bacteriology and virology. All these divisions contain accredited national reference laboratories manned by veterinary diagnostic specialists, specialist techniques, and high containment facilities for handling high risk pathogens (such as ASF & CSF). The VLS is a critical infrastructure to safeguard animal health in Ireland. The ever increasing complexity of the animal health environment and the needs arising thereof must be seen in the context of the current economic climate, depleted funds and workforce. This climate, not unique to Ireland, has resulted in detrimental rationalisation of national animal health laboratories throughout Europe and further afield. The convergence of increasing threats and consequences of exotic and endemic animal disease, the need to have critical mass in diagnostics commensurate with addressing these threats and the reality of depleted resources has created a focused dialogue for cooperation amongst stakeholders in Ireland and across Europe. Recognising that early detection of infectious disease is critical to a nations ability to access international markets for live exports and meat, the VLS has redoubled efforts to build critical mass and alliances nationally and internationally with sister organisations and concerned stakeholders. There are 10 accredited national reference laboratories within virology division’s high containment facilities, including for ASF, CSF, Aujesky's and for all intents, FMD. Virology Division has repeatedly demonstrated ability to have tests in place and validated within weeks of newly emergent viruses, most recently Schmallenberg virus, PEDv and Deltacorona virus. It collaborates with many national reference laboratories for high risk viruses and high containment facilities across the world. It is currently developing capacity for next generation sequencing for novel pathogens. Pathology Division similarly has accredited national reference laboratories and in the last year has refocused efforts in developing and maintaining pig pathology expertise for the Irish pig sector. In response to a need identified by the industry itself. Because Pig pathology expertise is a diminished resource across Europe, membership of the European Pathosurveillance and European veterinary surveillance networks have greatly enhanced the objective of improving and creating concrete links with pig pathologists, thus creating valuable connections and diagnostic collaboration. The VLS employs one of the two accredited pig pathologist in Ireland (FRCPaths) and she has commenced mentoring RVL colleagues in pig pathology so that scope and quality assurance of the service can be extended across the country with the main axis being Dublin and Cork. Continued development of pig pathology expertise is only possible because of the positive engagement with Irish consultant pig veterinarians who have supported and guided the direction of development in accordance with animal health needs at farm level. Through them the VLS is currently completing a pilot pig pathology project which aimed to create the necessary throughput for development and the collaboration required to characterise and define diseases on some large pig farms. This has evolved now to a more targeted investigation pilot project. The benefits of this has been immense not only in developing trust and collaboration with pig health specialists but also in identifying diagnostic and pathology needs for the industry and determining how value can be delivered to the farmer through his consultant pig practitioner. Pathology division has also linked with experts in Teagasc, UCD and CIT in studies on pig health in a determined effort to develop another ‘accredited’ pig pathologist and new diagnostic technologies within the government and academic laboratories, in essence to deep root the resource for the industry. Balancing increased global trade and movement of animals and animal products with increased vigilance and disease alert systems to protect both Irish farms themselves and their continued access to markets is good for agribusiness. The time for such systems investment is before and not after the event. The author has outlined only the first tentative steps by the VLS towards redressing the diagnostic and surveillance needs of the pig industry. No doubt, should these initial endeavours be successful, there is great potential for a plexus of skills and collaborations across the country to intersect in a common effort to protect and enhance the animal health objectives of the Irish pig industry and indeed Ireland inc.
Moriarty J. 2014. Delivery of a veterinary surveillance strategy for the Irish pig sector. 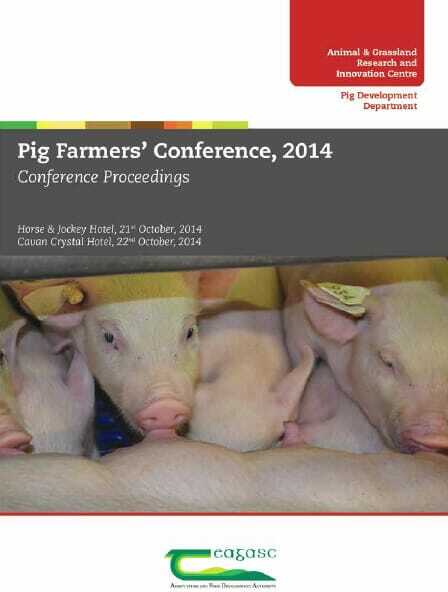 Proceedings of the Teagasc Pig Farmers' Conference 2014. 21 and 22 October 2014. p25-29.